If you’re a Kiss fan, there’s not a chance in Hell that you have missed the name Jean Beauvoir. As the co-writer for 80’s Kiss songs such as “Thrills In The Night”, “Who Wants To Be Lonely” and “Uh! All Night” with Paul Stanley, he has made himself a name in the Kiss community. Also, Beauvoir plays bass on a few tracks on both Animalize (1984) and Asylum (1985). Paul returned the favour by co-writing the songs “A Lover Like You” from Beauvoir’s band Voodoo X’s only album Volume 1 : The Awakening (1989) (a fantastic AOR / Melodic Rock album) and “Winterland” from the band Crown Of Thorn’s self titled debut from 1993. We’ll get back to them later. He has also written songs with the Ramones, Glenn Hughes, Doro, N’Sync, Debbie Harry and John Waite. Before that he made three records as the bass player with punk/trash rockers The Plasmatics, that featured wild singer Wendy O’ Williams (1949 – 1998), moved to Sweden for a few years and recorded two extremely underrated pop solo albums Drums Along The Mohawk (1986) and Jacknifed (1988) before he formed Voodoo X. But together with his platinum white, huge mohawk, it’s the band Crown Of Thorns he’s mostly known for. And that is where Micki Free comes into the picture. After Voodoo X, Beauvoir had decided on forming an all black AOR / Melodic Rock band, Beauvoir got in touch with Free through mutual friend Gene Simmons of Kiss and they formed Crown Of Thorns, adding bass player Michael Paige and legendary drummer Tony Thompson. The fact that Free was a mix of irish and Comanche and Cherokee Native American and not African-American was never mentioned back then. Not that it matters one iota. Crown Of Thorns debut album is today looked upon as an AOR classic. Unfortunately, the album was released right when Nirvana broke through and all rockers decided that it was no fun in having fun and the album sank like a rock in a well. If that was the reason for Free’s departure isn’t known, but the fact is that even though Beauvoir replaced him with his old Voodoo X guitarist Tommy Lafferty and has since released no less than seven albums – one greatest hits compilation and one album of demos included – Crown Of Thorns hasn’t released a record that could match the quality of the debut. Not that any of albums were bad, Beauvoir is a way too talented song writer to release garbage records. But his last solo album Chameleon came out in 2006 and the last Crown Of Thorns album Faith came out in 2008. so there has been really quiet around Beauvoir for some seven years now. Until the news broke that he has patched things up with Micki Free again and that they were recording an album together. Fantastic news, I think. It was time for Beauvoir to make some noise and stir things up again and who could be a better partner to do that than Micki Free? Of course I couldn’t help myself when the video for the first single and opening track “Angels Cry” was released. But the thing is, the song left me a bit underwhelmed. It wasn’t bad but I had expected more from the couple. I couldn’t hear the big, catchy melodies at all. But the song grew on me already by first listen and the second time it hit home. But I still think that it could have been better. It sounds like a raunchier and heavier version of Crown Of Thorns debut album. But the following track “Morning After” is a real gem. The building of the song is a bit unexpected though. The verses are all heavy rock that kicks up dust, but the ultra-catchy chorus is a lot more soft. A cool twist. The tune has a classic Beauvoir melody so it won’t disappoint any old fan. But with the title track it slides a bit again. It’s an ok song, decent a most, but this little rocker really doesn’t go anywhere at all. There is a great groove in “Whiplash”, an early 70’s Rolling Stones influenced rocker that sounds like it was written in a jam – this is awesome stuff! “Shotgun To The Heart” has a striking refrain, very much like what we’re used to get from Beauvoir, but this melodic rocker is good, not great – I keep waiting for the punchline, so to speak. We get an acoustic-guitar based AOR ballad in “Never Give Up” with a melody and a hook that any hard rock band would have sacrified their right nut for back in 1989. It’s a fantastic song and it deserves to be a hit. Let’s hope it makes it as a single. “Cold Dark December” is everything I could have wished for in a Beauvoir / Free team-up. The song kicks off with some Led Zeppelin influenced riffing by Free and the chorus is distinct with a big AOR feel – the mix is irresistible. “It’s Never Too Late” is Beauvoir de luxe – AOR at its best – another single. “She’s A K.O.” has this dark melancholy that Beauvoir is known for bringing into his melodies and this ballad’s melodies are brilliant. The album ends on a great note with some killer rock riffing mixed with big AOR melodies in “There’s No Starting Over”. As a whole, this album is both a bit disappointing and a very pleasant experience. Disappointing because there are a few songs that will end up in the filler section and I had hoped that the boys had avoided that with this album. Pleasant because there are a bunch of songs here that are the best Beauvoir has released since the first Crown Of Thorns album and proves that he and Free really are a great combination. 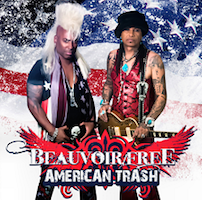 The thing is, Beauvoir is at his best when writes and records AOR, Pop and Melodic Rock songs, but since Free is a guitar player that moves in other territories – he does tour with his own outfit The Micki Free Electric Blues Experience – which has rubbed off on the songs here. Nothing wrong with that, quite the contrary, a bluesier edge creates another dimension to AOR music, but some of the songs here doesn’t move and seems to be based more on riffing – some riffs even borders to metal – instead of melodies and that’s when it fall flat. But for the most, this album is based on Beauvoir’s excellent choruses and contagious melodies and when he bring out those, he hit bulls-eye. Let’s just hope that Beauvoir and Free has found this experience satisfying enough to continue playing together. I really think they might be on to something big here. But I’m curious, why didn’t they just reform Crown Of Thorns instead of the Beauvoir/Free moniker? It’s not like the music is completely different to Crown Of Thorns. Well, be that as it may, it’s really trivial. Instead I recommend this to fans of Voodoo X, Crown Of Thorns, Jean Beauvoir and well, Melodic Rock in general. THAT’s what he looks like?? I had NO idea!! You have never seen a pic of Beauvoir? Really? Well, he’s a killer song writer. Do check out this one, Crown Of Thorns and Voodoo X if you get the chance. Great stuff. Yeah he definitely is a killer songwriter. I’m guessing I have never seen him before because you’d think I’d remember him!